It’s November?! I can’t promise I’ll blog every day in November, but I really would like to write here more, and it’s a good kick in the pants. I got it in my head that I wanted a new stranded colourwork hat pattern for my retreat class on the weekend, so here’s a sneak peek! It’s all peeries, which are small patterns of 1-7 rounds. After all the sweaters I’ve knit lately, it’s quite lovely to work up a worsted weight hat, and this one is extra fun! I’m just about up to the crown shaping now. 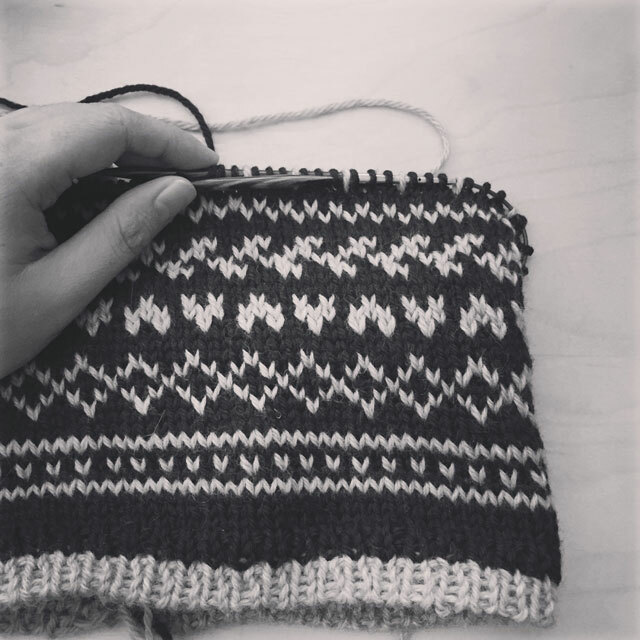 The pattern will be available for everyone in a week or two – I’m hoping to do some little handwarmers to match, or maybe full mittens? What do you think? 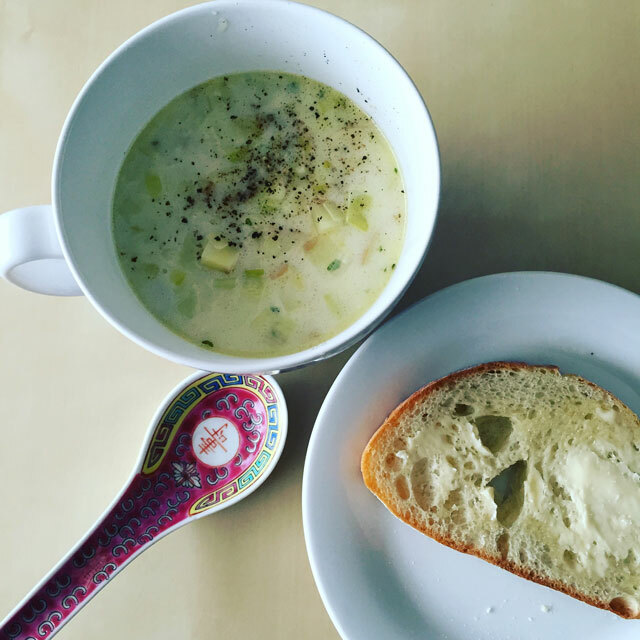 This leek and potato soup was yummy! My mods: more leeks, a mixture of unpeeled yellow and red potatoes (mini ones, because that’s what we had), and a splash of heavy cream at the end. Delicious! I really, really wanted cherry pie. I have a soft spot for canned cherry pie filling, but at $5/can I passed in favour of frozen sweet cherries for this pie. I looked at a few recipes, mostly this one. I don’t think I’ve ever made a cherry pie before. – My crust was a little too crumbly for rolling out this time – but usually I’m pretty good at it. I do want to experiment with lard pie crusts! – The sweet cherries are really big, so I would cut them up next time. – Plus it was a bit too juicy, so I’d either cook the filling down a bit in a pan, or discard some of the juices from the resting period. I should really know this by now, I’ve made quite a few runny pies. Time to try tapioca as a thickener, too. 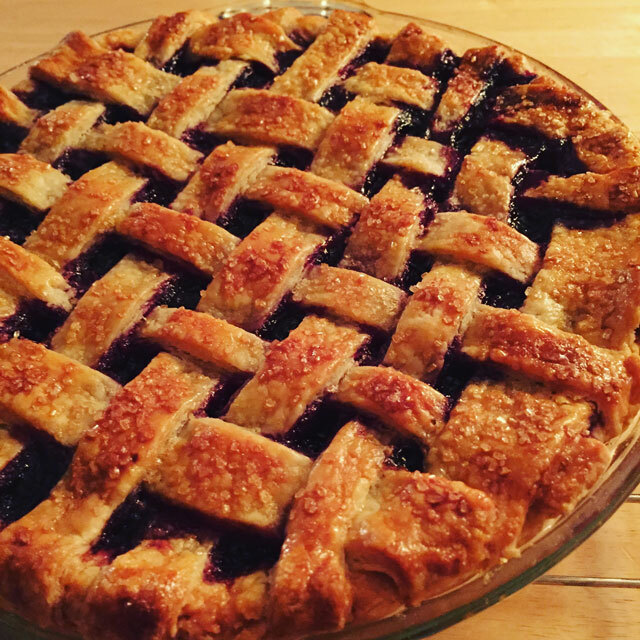 – Lattice top needs work – but that’s also related to the too-crumbly crust! – Topped with turbinado sugar, which looks pretty awesome. I LOVE the cute colourwork hat!!! I hope you do work up matching mitts. My DIL loves the fingerless variety! Now you’ve got me waiting for the pattern!! Love the hat! As far as lard pie crusts go: I’ve found that while they work up much more easily that butter crusts, half butter/half lard tastes better. I love your hat so far–and there aren’t that many stranded hats/mitts sets out there in worsted weight yarn. I’ll be keeping an eye out for this one for holiday presents! I, too, love the hat and am looking forward to the pattern. The soup is making me very hungry! yay to blogging more often. I love your photos and your writing.